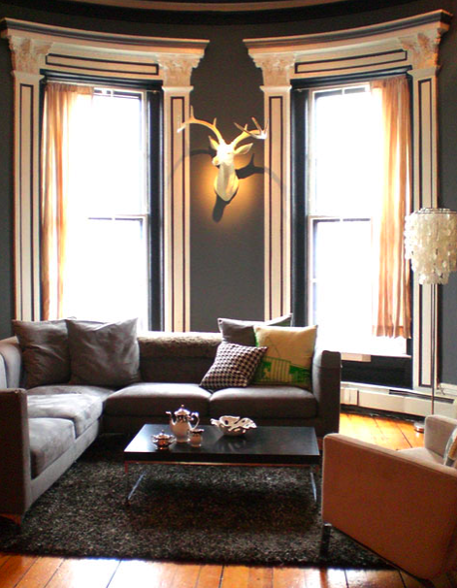 This weekend while visiting the lovely blog, CreateGirl, I stumbled upon this striking interior. I was admiring the clever use of contrasting black trim on white walls, when I realized I had seen the space before. Something about it was definitely familiar. So, I searched the 1,249 images currently saved in my 'inspiring interiors files' and found what I was looking for! Here it is, the same living room, only a little different! The home belongs to Boston-based interior stylist Brad Dufton of ColorTheory and his wife Kendra, a visual manager for Anthropologie. From what I can tell, they certainly do know a thing or two about color and creating visual impact! Not convinced? Check out the rest of their pad right here! But the question is, which way do you like it best? update: just heard from the home owner that the 'white' walls are actually Benjamin Moore's 'Silver Sage.' Lovely! I personally liked it with the contrasting black trim on white walls(the first one). It gives it a very strong impact-full visual feel, along with the other black spotted in the living room. Not too much, just nice. Wow I can't believe you also lived in Rome! I am certainly loving it and never want to leave ;) I'm also glad I found your blog as well, what beautiful images and topics you provide! Oh wow, amazing what you can do with paint, I love the first! I totally relate to the "1,249 images currently saved in my 'inspiring interiors files" ... me too. I'm building a house and keep saving images from you talented decor bloggers. I think the white walls with black trim is has more visual impact. The transformation just a little paint can have is amazing sometimes. Also, did you change your header on your blog? I like it! The first one looks more refreshing for me! Thank you for your very kind and encouraging comment on my blog!!! I'm loving the one with black trim. So cool. So unexpected. My favorite is the one with the black trim. It's so chic and I love the idea. Pretty cool that you found the other picture! Beautiful home, just checked out the whole tour! Love the contrasting stripes, brings such strong architecture to the space! That's amazing you were able to recognize it and find the previous shot! Love it. Both are striking. Figures she works for Anthropologie...how divine. How funny to have saved the photo from before. I like a combination of the two--I'm partial to the Nelson lamp (I have one at home just like it) and the gray walls of the second one (also like my house). It's very stylized though in both cases--they have a definite point of view! I can't make up my mind, I love both of them! The black trim against the white is absolutely jaw dropping though. The black and white in the first room are so dramatic, but I love how much warmer the room feels with grey on the walls. And those windows! Stunning. I just adore large windows that let the light in. Definitely the first one, the black trim has more impact and the white walls make the room feel bigger. Oh, how fun to see the same space too different ways. I definitely prefer the first one--love the contrast and the details the black adds! It looks like most people like the first image best...I would have to agree! Something about that black on white paint! i like the black on white for spring/summer and the darker color scheme for the autumn/winter! both are so inspirational and luxe that i can not truly choose. I agree, the first image is cleaner. I think I need to start replicating rooms I like. That will be my decorating rule. That is so hilarious! I love them both - too hard to choose. wow that's absolutely ridiculous. think i like the darker walls, although white generally has my heart. :) maybe i'm leaning more towards the darker colors because its fall...and i just want a cosy living room. in any case, both are lovely! The upper photo is similar to how I have my pool table room decorated with black and white. Interesting blog the places actually look like a man could live in them. I agree with Mama Fashionista! For the brighter seasons, my taste would select the first image, for its lightness perhaps. For cooler months, when a person craves a cozy space, the second image. Crystal! It so nice to see continue this conversation over here. When I first saw the top photo I fell in love with it for the sharp contrast. Than you sent me the second image and I have to agree, with fall here I love the cozy feeling the dark walls creates. Its amazing how even the furniture gets a new life with a fresh coat of paint!! LOVE the details ...the molding and black and white in the first shot is killing me! Love those dark walls!!! Thanks for visiting my blog...can't wait to see what I find on yours! that is my FAVORITE home. i have posted about it not once but TWICE because they change the look of it often and now it's BLACK & WHITE! this is news to me. but i still love it. last i heard, it was on the market. I'm so impressed by your eagle eye! Until someone writes an amazing piece of software that can make these connections, you're priceless. I like the white walls/black trim much better. I can't imagine repainting that trim more than once! I think I'm liking the dark walls and white trim... So cozy. But more importantly - where in the heck is that couch from?! That is the ideal grey sectional I'm looking for!!! Any ideas??? Just wanted to say thank you for all the positive feedback, happy to know so many people enjoy our homes' personality. As for the 1st pic, believe it or not, the walls are not White. "Silver Sage", it's in fact a grayish green color. Finally, my wife and I have just sold this condo, and have HUGE plans for our future home. If you like this home, wait until you see what we have in store! Check our website in 1 month for pics. I think white walls with black trim is so intriguing and unexpected. It's something that I have always wanted to do, but have yet to expirement with. I am thinking about trying it in my super small guest bed room. The only thing is, I think the trim needs to be really substansial in order to make the impact that I want it to... and I have regular sized trim. WOW! Love the white walls and black trim. Talk about making a great statement! Hi there, and thank for the props on my cage! As for the paint, I'm leaning towards the bottom picture! The painting in the trim is kinda of endearing and reminds me of top hats, tuxedos and carnivals for some reason. Love the lighted carcass head on the wall, lol. Crystal... It's funny, I have been in love with the grey and white walls for sooo long, and I didn't think I could like the room any other way... enter the black and white room. And now I love that one, too. I honestly can't say which one I like better! My pick is the white walls....! both ways are beautiful but if i had to choose, i'd choose the first room. it's just lighter and more open feeling to me.